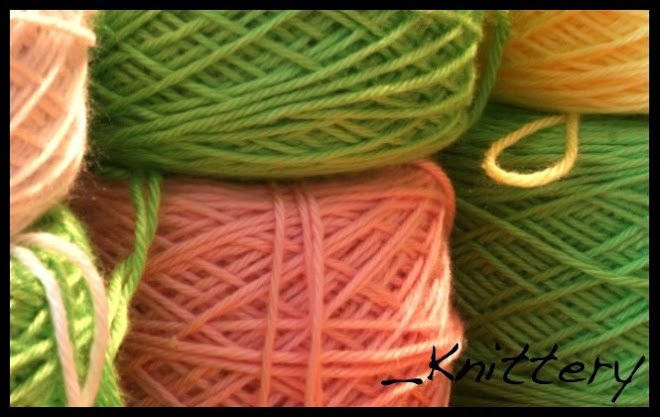 _Knittery: Summer break has started! Well I'm home from school, I've been home since Thursday. I moved home from school Thursday. So I've been home for a few days now. So far I've not done much of anything. and, to be honest that has been so nice after a crazy few days of finals. It's been really nice to sit and relax. For the past few days all I've really done is knit, play with Bella, listen to my Harry Potter and the Deathly Hallows audio book, or watch Lost (Don't tell me anything about it!! I've only just started season 3). It has been an ok couple of days. But come next week, I'm gonna start trying to be productive. I can't just let myself sit around all summer. That would be nice yes, but it would get old fast. So for one I'm gonna start walking Bella daily again I think, she could really use the exercise and attention as she has taken a liking to chewing shoes lately. That tells me that she isn't getting enough attention and has too much energy. Other than that, mom should be dropping my bike off here in the next few days and that will be nice to have around for exercise and transportation. I really love my bike. I'm (im)patiently awaiting to hear what my final grades are. I'm so nervous that I've failed my Design 2 (3D design) class. I don't feel like I did very well in the class overall. It doesn't help that the professor never gave us a real syllabus or grading rubric though, that makes things more difficult. I know that I passed my World Changers class (FINALLY!!) with an A, and General Psychology 2 with a B. This makes me happy! I'm still waiting to hear my final grade for the drawing class too. My first book from Booksneeze.com arrived today! The book is "The Heart Mender" by Andy Andrews. I do not know that much about the book yet, but I look forward to reading it. I will be posting a review of the book here once I finish reading it. I'll be going to Texas in a few weeks to spend some time with some dear friends of mine :). I'm really excited about this! I'll be sure to post about when I'm leaving when I figure that out for sure. As for what is on my knitting needles lately, well, a lot of things. And there are a few things I've been meaning to start. I'm of course knitting Recovery Buddies. In the last 3 days I've made 4 of them, and have another on the needles. I really need to try to get a handle on the waiting list. 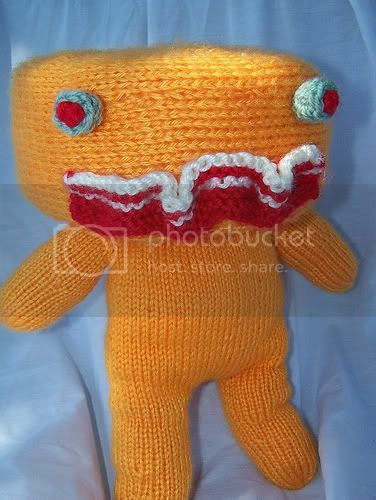 But sometimes that just feels like an impossible task, as I'm getting requests for buddies faster than I can knit them. I really wish I could get more people involved in knitting them, Allison and I just can't keep up on our own it seems. But there hasn't been a lot of interest in helping knit them. I was trying to organize a knit-a-long, but I didn't get much of a response to it. Any ideas on how to get more knitting support anyone? Other than buddies (because I can't knit just buddies or I'll get burnt out) I've been working on a sweater for my sister. I'm using the pattern and construction of "$5 in Paris" and modifying it a bit to have an "S" on the front of it to make it a Weasely sweater. It's been a bit of a challenge for me. I have discovered that I really am not a fan of colorwork. It just is more work than I really care to do. I can do it, I just don't enjoy it that much. I frogged the "S" about 10+ times before I got it to look the way that I wanted. The sweater is nearly complete though, I just have to finish the second sleeve. Thinking of sweaters, I've been meaning to start a "Brobee Sweater" for my niece, Arianna. I just don't have the yarn I need for it yet. I wanted to get it done for her birthday party, but that just didn't happen. Her birthday party is tomorrow (well, today by the time this gets posted). She turned one on Friday the 30th of April. I can't believe that she is a year old! That is just amazing to me. I can't wait for her party, it should be a lot of fun. That reminds me that I need to charge the battery for my camera before the party! I also need to start another baby blanket soon! I won't say who for yet here, but some of you already know. The gender of the baby is still unknown, and that is why I've waited to cast on, as that will determine my choice of pattern and color(s). So I am still waiting to hear from the parents of the baby as to what the gender is. I also might knit a toy for the baby too. We'll see. This week has been long, stressful, and I'm glad that it is over. So glad. There is a lot that is going on that I'm just not comfortable posting here. Wednesday I have 3 ED team appointments. I'm not exactly looking forward to this as it is sure to be a long, draining day. I have my Dr, Psych, and Dietitian all in one day. Urf. This is good though because it saves us drives down to Indianapolis. I think that is all that I want to talk about on the blog right now.